Formulation, featuring, blending and production of resistive, conductive and dielectric inks. Type C clean room (class 100.000), with screen-printing equipment. In-house designed and fully automated assembly lines and automated control systems which verify and guarantee electric parameters in 100% of pieces. Continuous electrolytic bath machine for metallic parts. 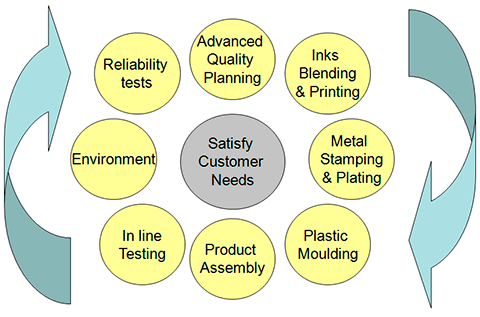 Metal stamping and die-cutting machines. Several laboratories with state of the art measuring and testing equipment: Quality, testing, chemistry, thick-film technology, electronic, etc.